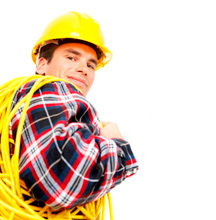 Lindgren Electric | Commercial & Industrial Electricians | Holden, MA. hour service, 7 days a week for all emergency situations. Our capabilities include motor controls, machine tool wiring, commercial power and data wiring, new construction, remodels or additions, service changes, swimming pools, generators and more. Personal attention from proprietor Shaun Lindgren ensures that your project receives the attention it deserves, while the staff of skilled electrical technicians ensures your work is done as promised.